The National Gardens Scheme (NGS) is a fantastic charity, started in 1927 and now orchestrating access to thousands of private and public UK gardens each year. The publication advertising the opening dates, fondly known as the yellow book, is eagerly awaited each February. This year we’ve been trying harder than usual to get out to see gardens included in the scheme, including Windy Ridge and 3 Stone Road, both in East Kent. We will be taking the plunge ourselves at The Watch House next year, which is an exciting and just slightly daunting prospect. Though almost all of the private gardens that participate in the scheme are significantly larger than ours, most do not run to the acreage of a National Trust property and certainly get by without the same number of staff. It makes for a great afternoon out when two or more smaller gardens open at the same time. Such was the case when we were in Cornwall during August, visiting the leafy countryside around the village of Constantine. 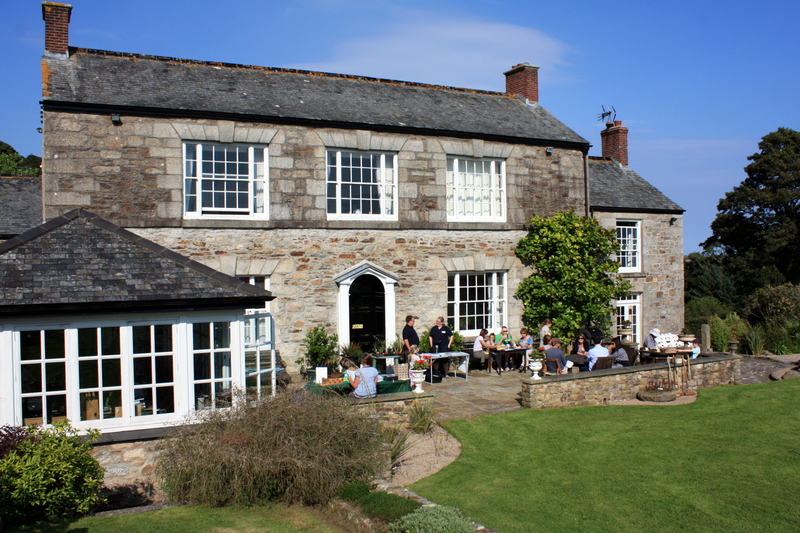 Following a narrow road, bounded by typically high Cornish hedges, we arrived at Buck’s Head House. The weather was bright and sunny. A stiff breeze gave away the site’s exposed situation, just a few miles inland from the south coast. 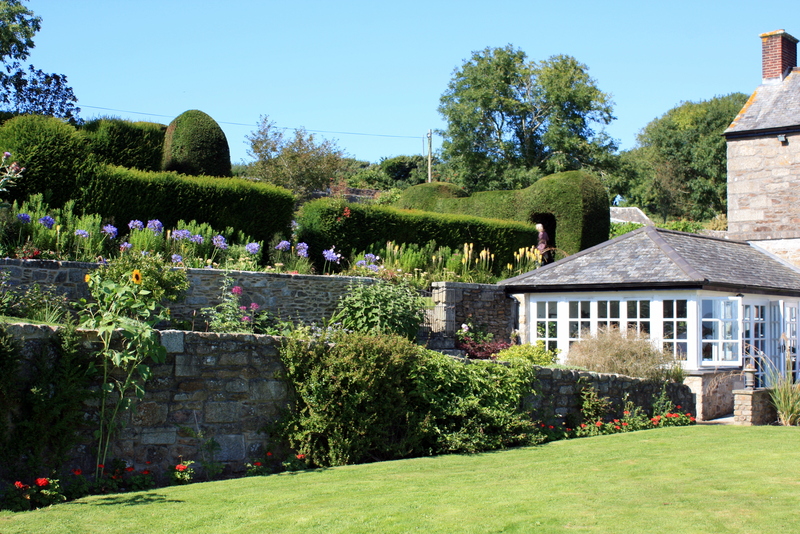 The solidly built stone house enjoys three completely separate gardens, crammed with interesting and unusual plants. Many defied my powers of identification, but in the way of garden visitors there were others who were ready to help fill in the blanks. My first puzzle was a large shrub which looked like a senecio with purple flowers. This was in fact Olearia ‘Henry Travers’, a lovely plant from New Zealand with glistening silver evergreen foliage. 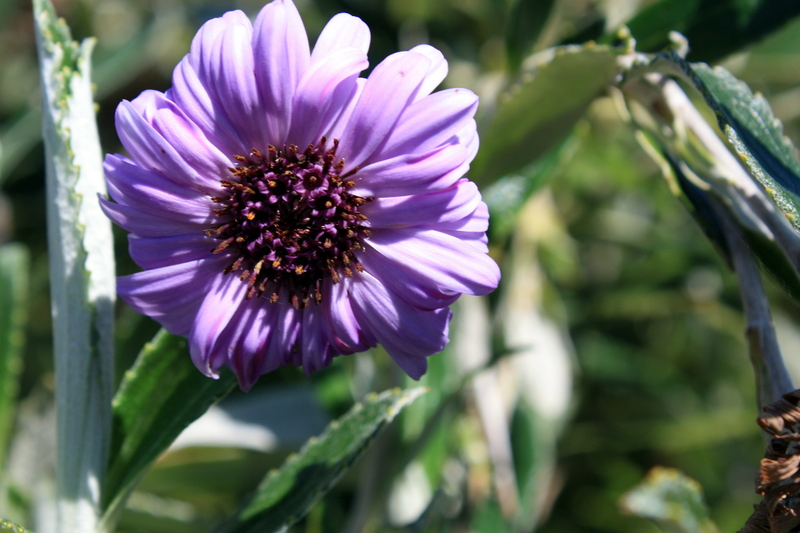 Lilac daisies with a distinctive purple eye appear in summer and were just coming to an end. It’s known to be difficult to establish and will only survive winter outdoors in the mildest climes but, what stunner! 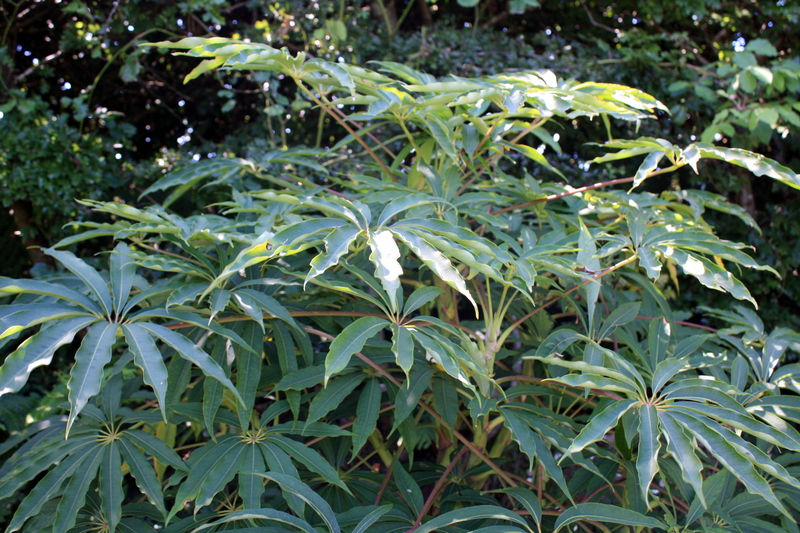 On the opposite side of the garden a more familiar plant, Schefflera taiwaniana, was developing into a large specimen in the shelter of a tall hedge. 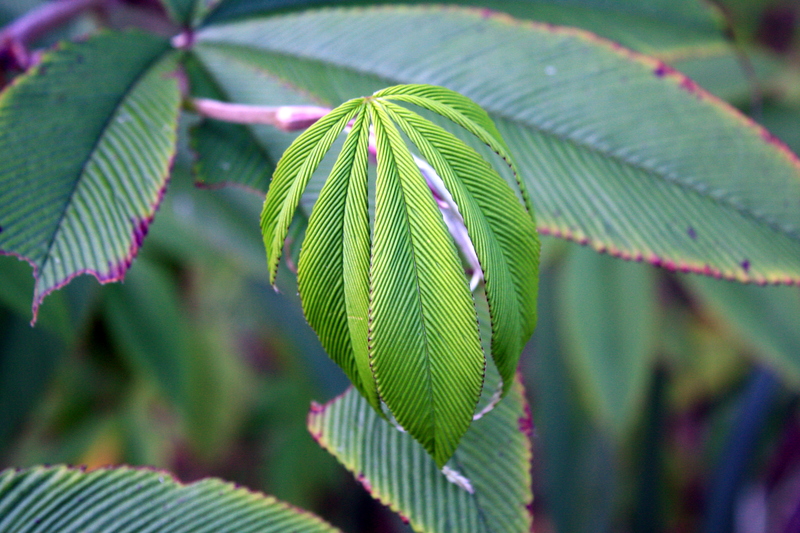 As its name suggests, this Schefflera comes from the highest mountains of Taiwan and is a little tougher than its neighbour. A great foil for brighter, showier tropical plants. In 2006 an adjacent field was aquired and has been turned into a garden with a very different feel. The aim is to create a woodland garden, and that ambition is well on its way to being achieved. 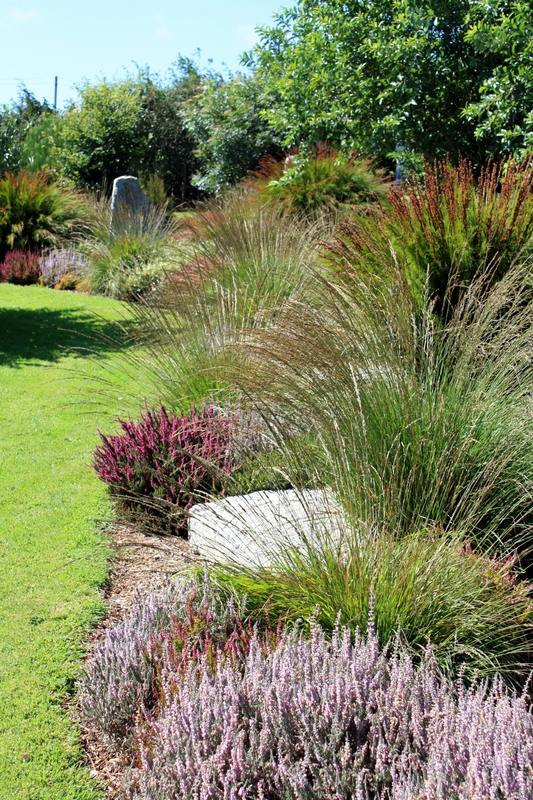 At this interim stage the effect is perhaps a little municipal, but there are some great bits of planting design, including an artfully tumbling ‘riverbed’, naturalistically populated with rocks, heathers and restios. Restios are a peculiar group of plants, mainly from South Africa which boasts around 330 species. They bear a close resemblance to horsetails. Thankfully they don’t share their invasive habit, instead forming tight, sometimes arching clumps with the look of an old-fashioned shaving brush. I was unable to identify this one, but what an extraordinary shade of green, set off perfectly by the gravelly setting. 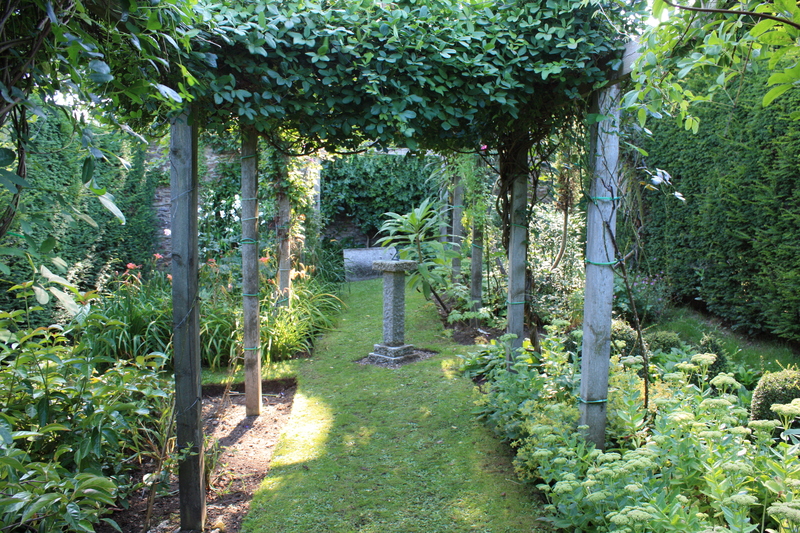 The next garden, known as The Garten, lay less than half a mile down a lane with grass growing in the centre. In complete contrast to Buck’s Head House, Drs Sara Gadd and Daro Montag have created a garden based on ecological principles and with children in mind. What the garden lacked in coherence – for me too many ideas packed in without strong enough links or structure – it made up for in charming set pieces. 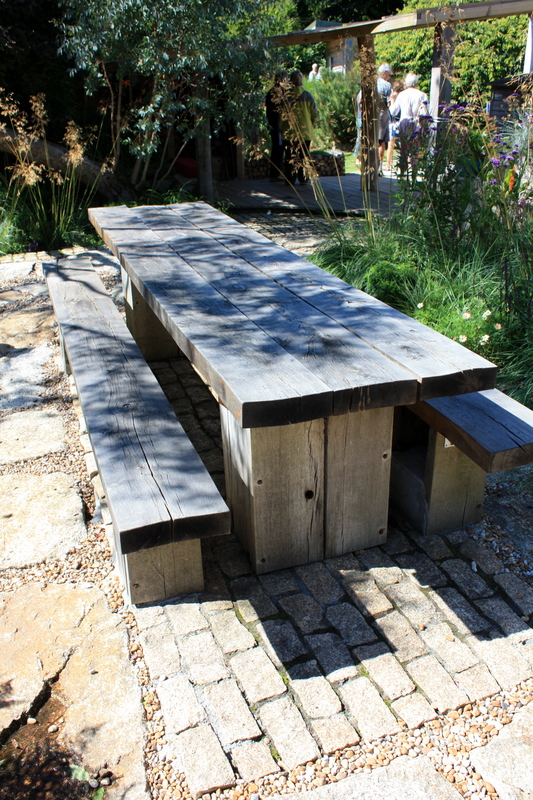 The first of these was a table and benches constructed from handsome chunks of timber. The weight of the furniture was offset by the delicacy of Descampsia caespitosa, its golden scapes sparkling in the summer sun. A raised studio set on a wooden deck provided the next focal point. 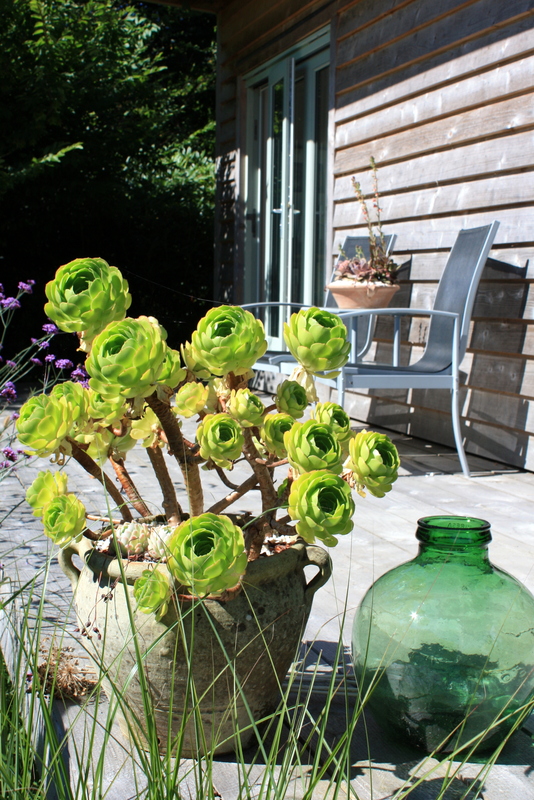 A potted Aeonium arboreum revelled in the sun next to a glass bottle – the type I used to use as a bottle garden when I was a child. The deck was reached from a series of stepping stones emerging from clumps of golden saxifrage – a unique and rather lovely contrast to the modernity of the building, almost Japanese in feeling. Winding through shrubbery, we shortly arrived at a small glade planted with ferns and given a slightly tribal feeling with totem-like piles of rock. 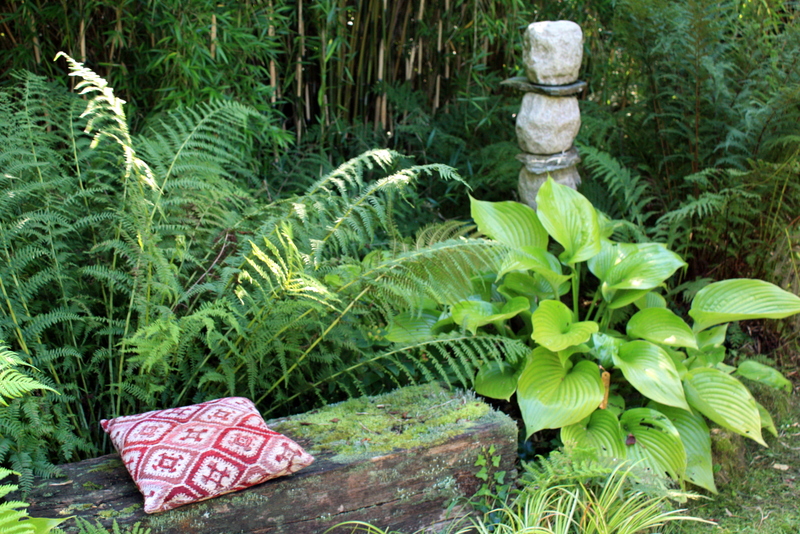 A bench, made comfortable with a cushion, created an inviting place to sit and enjoy the leafy surroundings before venturing into a neat vegetable garden and then back out onto the lane. 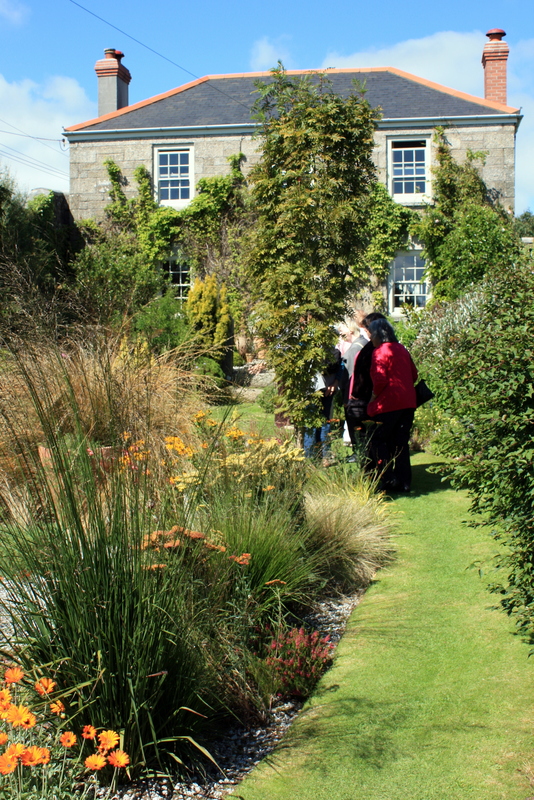 Not content with the two NGS gardens we continued on to Trenarth, a garden which had opened on the same weekend for the Cornwall Wildlife Trust. The owners of Trenarth are blessed with a glorious position, perhaps only bettered by another grand house on the opposite side of the valley – but then the grass is always greener! A large pine at the end of the drive is all that remains of an avenue that once led to the front of the house. The terraced walled garden is one of the highlights and is host to a series of garden rooms, as well as a collection of tender climbers. 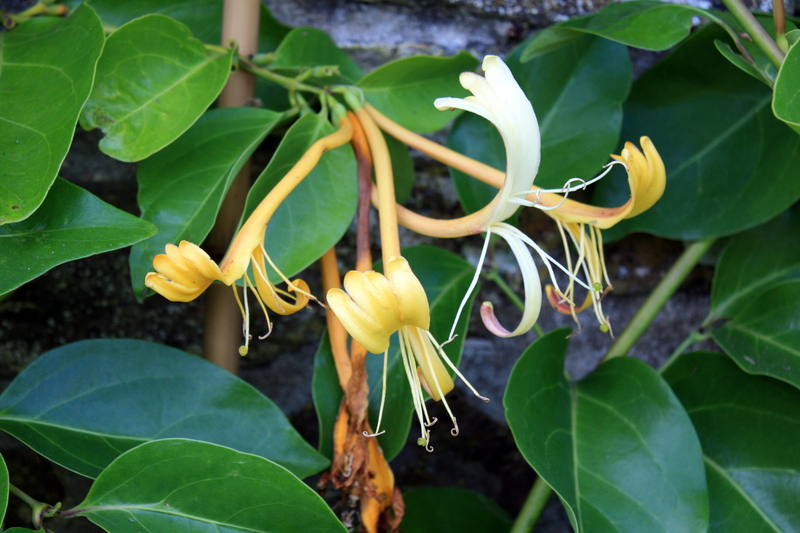 Outstanding amongst these was a giant Burmese honeysuckle, Lonicera hildebrandiana, its tropical flowers as long as my fingers. This superb scrambler was named for a Mr Hildebrand, once superintendent of the Southern Shan State in modern day Myanmar. The walled garden also contains a pretty herb and vegetable garden, serviced by a refurbished potting shed. I’ve featured this photograph before, but make no excuse for using it again. 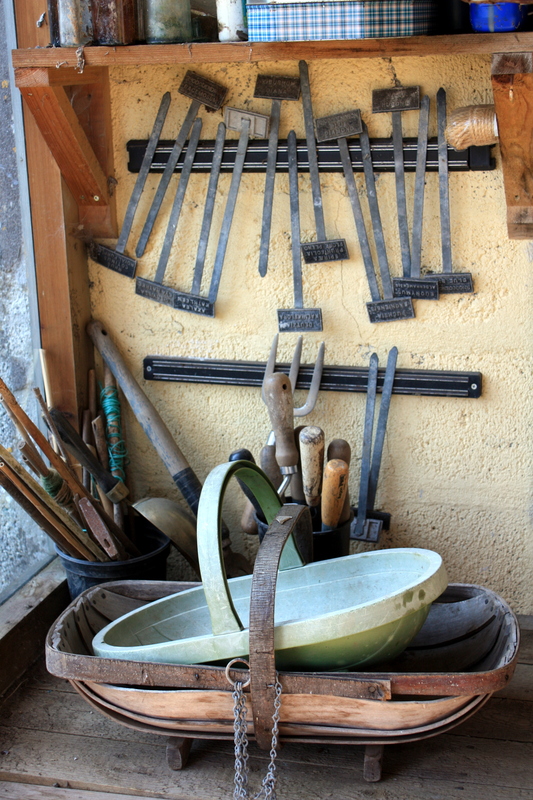 A neat potting shed is worthy of any gardener’s admiration, especially when it comes complete with old zinc plant labels recalling the successes and failures of gardeners past. At the lowest point in the garden a bog has been created, complete with obligatory Gunnera manicata, primulas and irises. Less expected were the arching stems of Rubus lineatus, bearing finely creased leaves in the brightest of greens. Hard to conceive the close relationship with our common bramble. With the exception of a handful of magnolias, camellias and hydrangeas, the garden at Trenarth has been created within a period of just 20 years. The setting, combined with the handsome stone house, suggests something significantly older and more established. 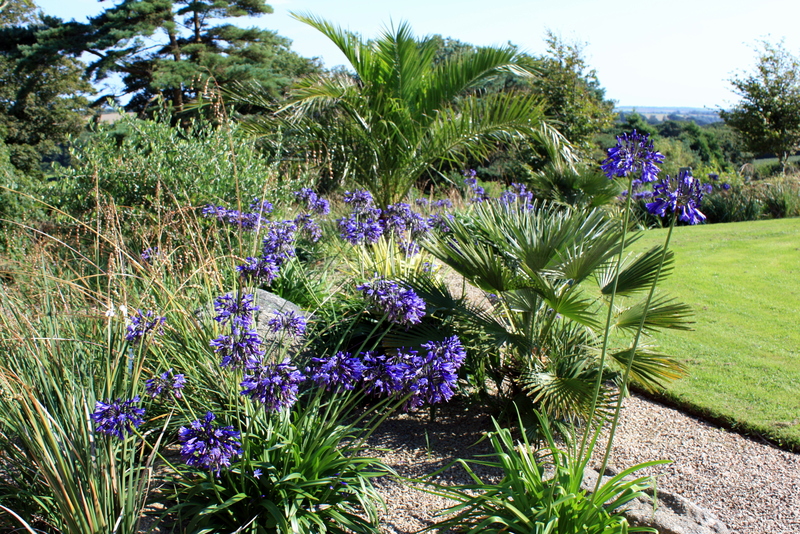 But, as we know, all gardens are an evolution, and close to a corner of the house was a new gravel area planted with Dierama, palms and deep blue Agapanthus – the perfect trio for a sunny spot and a new chapter in the garden’s story. Of course no garden visit would be complete without tea and cake, and since we’d visited three different gardens in one day we chose three different cakes, all delicious, all devoured within seconds. Thanks to both charities, within the space of a few country miles we’d experienced three different and very personal gardens. We returned home sun-kissed, inspired and with just one or two new acquisitions in the car boot. For opening times in 2014, check out the yellow book, published in February 2014, and the website of the Cornwall Wildlife Trust. What an interesting post. What I find really fascinating is the ‘woodland’ gardens and what we would call ‘cottage’ garden plantings – a mix of many different varieties of plantsiin the same bed/garden. 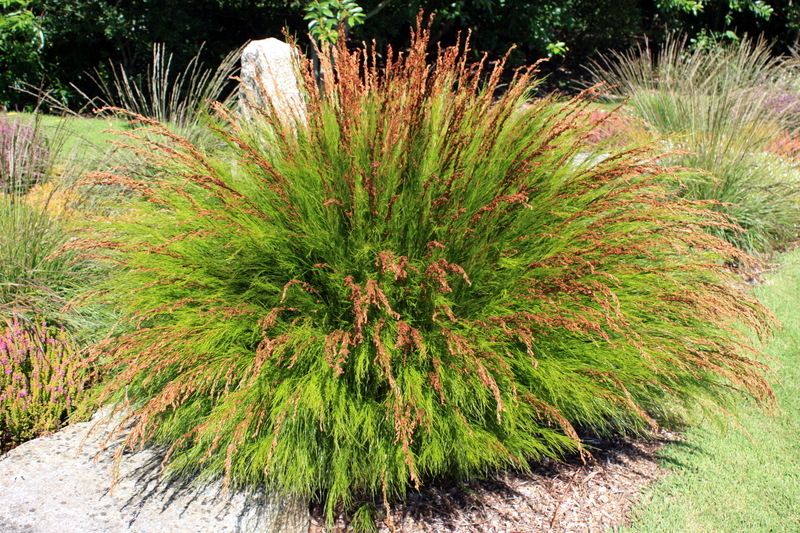 This is not very common in Australia, where today, ‘mass plantings’ of a single plant are far more common. Perhaps it is the style of our housing that lends itself to this where the look is more streamlined and ‘contemporary’ with a lot more glass and outdoor living spaces. Coupled with extremes in weather – we can have 42 degree heat with drought conditions,through to minus 3 and heavy frosts all within the space of 4 months, it makes plant selection very challenging. 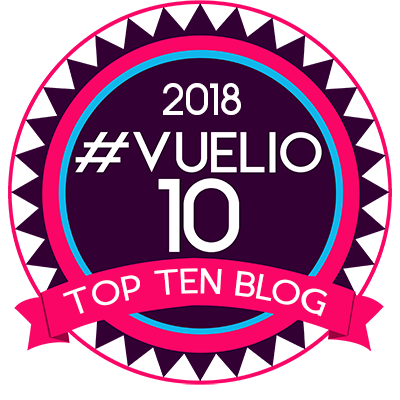 Our gardens (and as a general comment, are no where near the standard of those in the UK in my opinion) FG – this is a very interesting post… perhaps one you should consider for the comp, as it ‘plugs’ the national garden scheme too… Can you enter more than one post?? ?